FansVoice: Some people really stand out to me in their dedication to the game. Anthony is one of those. His passion for telling the story of football through various mediums is extraordinary. 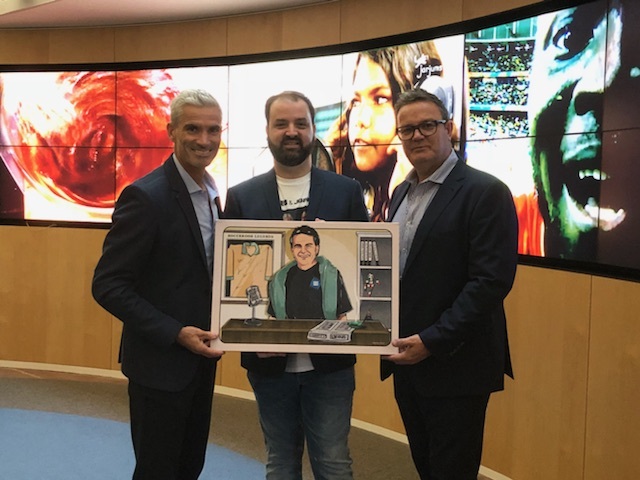 Whether it be through social media, artwork or fashion, Anthony continues to promote the history and foundations behind the world game in Australia. This is his story. I grew up in the south of Sydney in a suburb called Kareela. Most of my life was spent in the Sutherland Shire. I was born in Australia to Greek-Romanian parents, who emigrated in 1955. They were only toddlers, so really, they were well adjusted culturally when bringing me up in Australia. I have a sports coaching and administration degree with high distinction and have been a vocational trainer and assessor in the area of sport development for the past eight years. I have worked for a number of Sydney’s leading private colleges. Late this year, I started Futbol Cult. I tell Australian football stories on t-shirts. It is a really exciting time to be sharing stories about the history of our game. What better way to do it than through fashion! I am so grateful for the wonderful response from the genuine fans out there. My interest in football has been passed down from my father, who has supported the game in Australia coming on 60 years next year. 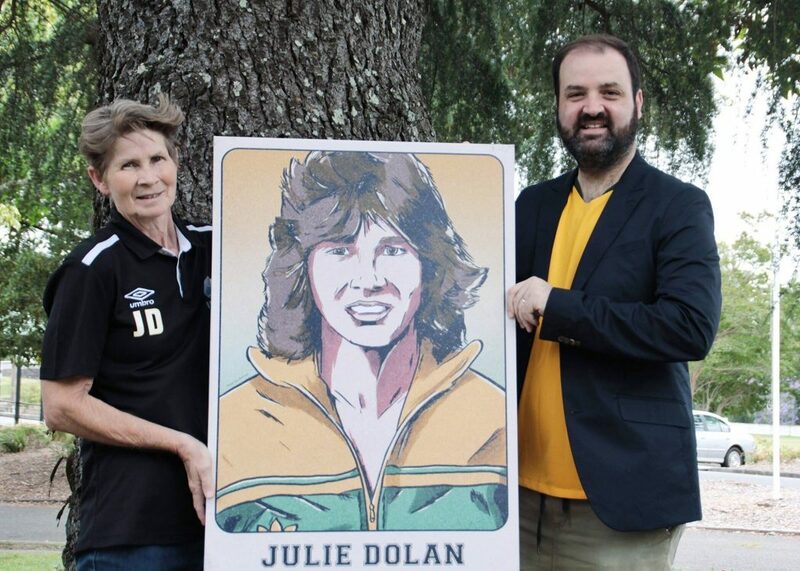 He would take me to matches from about the age of seven (1988) and I would have seen around 450 NSL matches with him and over 100 Socceroos matches. We attend Sydney FC matches together (foundation members). Although, recently, he has lost interest after yet more politics in the game. 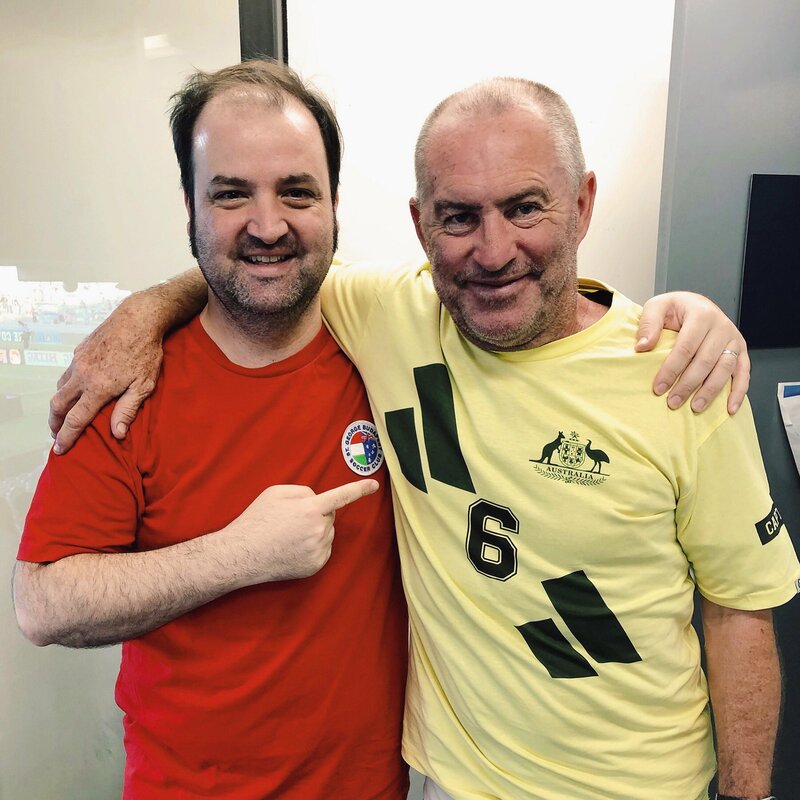 I have some great memories from those early games, sitting under cover at the Sydney Football Stadium, watching Charlie Yankos crack a free-kick in against Argentina from what seemed like halfway at the time – 1998 Bicentennial Gold Cup. When I was a kid, I played my junior soccer (it was called that at the time) for Georges River Junior Soccer Football Club in Oyster Bay. I played there for about five years, mostly in centre-midfield. My fitness was pretty average but my ability to read the game was good for a young fella. I got distracted by other things and stopped playing during high school. I was asked by my neighbour, who was the president of the local club where I was living, Gwawley Bay Soccer Club (Graham Arnold’s junior club) to coach the Under-10s. I accepted and stayed there for five years, winning one premiership. I was awarded the Clubperson of the Year in my final season. This was a voluntary role. In the last year of coaching at Gwawley Bay, I really had the motivation to try and take it further – if nothing else, learn more about the game than what I knew from a fan’s perspective. I enrolled into a degree course at the Australian College of Physical Education to study coaching and administration full-time. I was 26 years old and a mature-aged student. It was tough at first, as I had not studied since my HSC in 1998 and I did not perform well in that at all. I was happy to just pass but after my first semester I started to really enjoy the study and environment of being around lecturers, coaches and elite sportspeople. So, I got good grades. After my first year, I really had a goal of trying to graduate first in my year. It started as a bit of a throw away comment, but a few classmates really pumped me up and I never lost sight of the goal, achieving it in front of professional athletes and people who excelled in sport since childhood was a great achievement. Along the way, I used my studies as a reason to get in touch with football people, building good relationships along the way. Around that time, I started blogging to develop my writing skills and took casual teaching roles to earn an income. Like most people, paying the bills is a necessity, so a lot of my work from there centred around vocational education in the area of sport. 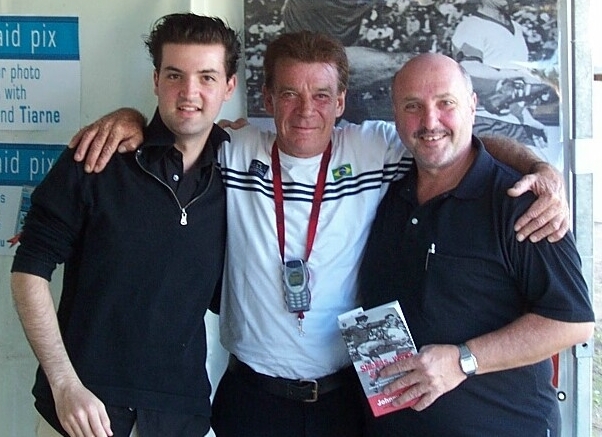 Coaching roles were not well payed, if at all, and the types of administration roles available were few and far between – teaching became something I grew to enjoy, especially mentoring young people, which was also something Johnny Warren was very passionate about. My work for Johnny Warren really began after speaking to his daughter. I had known Jamie Warren, who runs the Johnny Warren Football Foundation, but it was through Johnny’s daughter Shannon that I became involved. We had a chat in 2014 about working together on developing her father’s legacy online and to a new fan base, focusing on young people and bringing them the history of the game. I needed a project to work on, and after a bit of convincing, she agreed to let me basically tell her story and share things she had from her father. We called it the Johnny Warren Community, which we recently changed to Johnny Warren Fans. We now have 15,000 followers and have achieved some great goals together. All for Johnny’s legacy, of course. Neither of us made any money from it. It was always about the passion for the game and remembering a man who sacrificed everything for football. Over the years I have had the opportunity to meet some amazing people. I am not the starstruck type. Although, watching Diego Maradona at the SFS in 1993 was special. 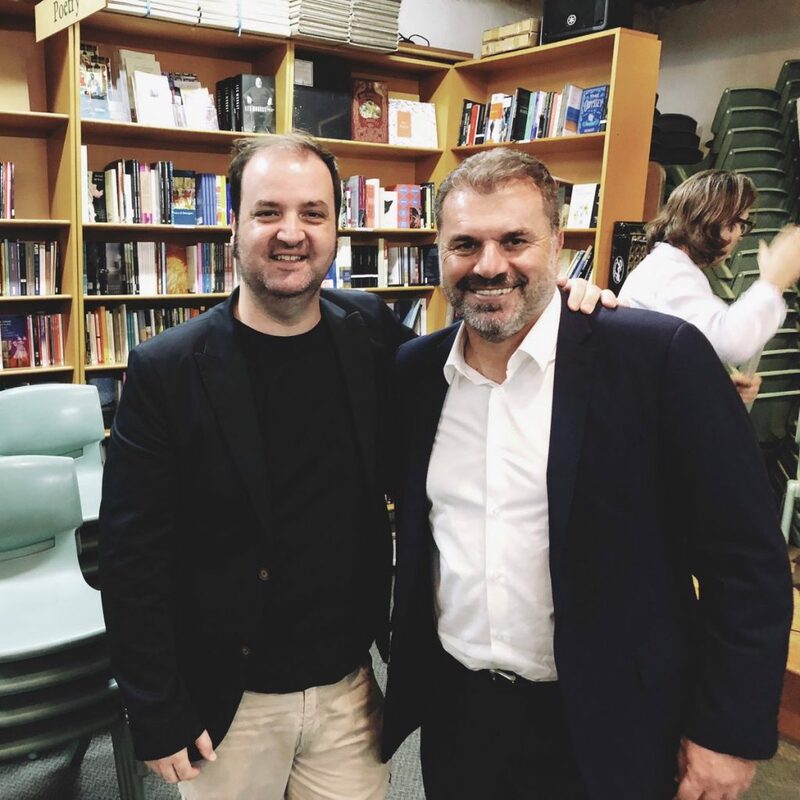 In terms of meeting people, Paul Wade, Harry Kewell, most of the ‘90s Socceroos and a few others have been nice. The most famous person I have met is probably José Mourinho. I was in a room with him for two hours with the Chelsea Asia guys when they came to Australia. He was an inspiration to me when I started coaching and studying in 2004. The most memorable game I have been to would be the Uruguay game in 2005 but nothing beats the atmosphere I experienced in 1993 at the SFS. I will never forget the sea of confetti across from me. Argentina had a team of absolute superstars. Firstly, a change in culture. Culturally, we have it wrong in Australia. We tend to alienate our own to appease the mainstream. Until we believe in ourselves and focus on football-specific activities, we will always be beholden to rugby league and especially AFL. We need to embrace a worldly view of football rather than trying to Australianise it culturally. Immediately, I would like to see more investment in resources going to the grassroots and a stronger focus on women’s football. They have proven over the past few years that they are well on track to achieving something special – we cannot miss this opportunity. Expansion is something that needs to happen. Ten teams was never enough for such a period. I understand that financial and commercial considerations are critical in decision-making. However, I would personally like to see 14 teams, with each having their own W-League team playing double-headers. Canberra and Wollongong have to come in at some stage. Regarding promotion and relegation. The discussion around it is mostly toxic, led by people who act purely on self-interest and their inflated egos. I laugh whenever I hear or read someone who never attended an NSL match talking about what pro/rel will do for the game in this country. There is no better teacher than experience. In my experience, pro/rel is something that needs to be considered very carefully. The bitterness that exists in the game from people who cannot grasp the failings of the NSL and its clubs can be counter-productive to the broader discussion, which is inclusiveness . I would love to see pro/rel but not at the expense of the A-League and certainly not to open a door to the cronyism of the past. Culturally, the game needs to be united. Unfortunately, there have been two camps historically. The post-2003 Lowy era and old soccer. The game will not develop by having a persecution complex, as it will not develop ignoring the game’s history. As Johnny Warren said, acts of self-interest ruin this game. I am hopeful, one day, we will have a change in culture, where people want football to succeed rather than their personal allegiances. As for the new Board, I am a fan of Heather Reid and Remo Nogarotto. The others have to prove to me that they are football people. We need strong leadership and governance, but also people with a football head on their shoulders to not miss crucial opportunities. I sometimes ask myself whether this is as good as it gets for the A-League. However, time can change lots of things. When one generation retires or passes on, another can make great changes and build something strong. You never know. In my lifetime, I do not believe I will see football as the country’s number one sport, but really, it is not important. What is important is being competitive within the sport. I will be honest and say that over the past two or three years I have really dropped off Twitter. Mainly because it has become very nasty. People tend to play the man and not the ball. I get particularly frustrated when I see people I know in real life getting abused for having a contrary (and valid) opinion. I know quite a few people in real life. So, those relationships mean more to me than #SokkahTwitter. You can get really emotionally caught up in it, confusing banter for personal attacks that leave you walking away feeling battered. That is to the detriment of the real and physical relationships you have. I value those far more. There are a few people who get away with some outrageous behaviour, to which I just laugh nowadays. Having said that, @Elia_Santoro is my favourite person on Twitter. I also get on with people like @ChristineWhyte. A lovely lady. Saying that, I do find some of the memes about the A-League really funny. There are some creative people out there, who have a real eye for comedy. In terms of strange, Twitter for the most part is strange to me. People valuing the opinions of others whom they have never met, usually hiding behind an avatar, over keeping real relationships. I will never understand that. To me, loyalty is everything. More recently, the cyber bullying and trolling has been something I have chosen to ignore, but it has gotten way worse than before. I am sure there are people who have mental health challenges from Twitter that go unmentioned. Most of my social media interactions these days are on Facebook and Instagram, people I know.